Director – Joe Dante, Screenplay – Jeffrey Boam & Chip Proser, Story – Proser, Producer – Michael G. Finnell, Photography – Andrew Laszlo, Music – Jerry Goldsmith, Visual Effects – Industrial Light and Magic (Supervisor – Dennis Muren), Special Effects Supervisor – Michael Woods, Makeup Effects – Rob Bottin & Chris Walas, Production Design – James H. Spencer. Production Company – Amblin/Universal. Test pilot Tuck Pendleton is placed in a one-man submersible and reduced to microscopic size as part of an experiment where he is to be injected into the bloodstream of a rabbit. However, industrial criminals break into the laboratory and steal the controlling microchip from the miniaturizer. One of the scientists runs with the syringe containing Tuck and accidentally injects it into the buttock of neurotic supermarket clerk Jack Putter before he is shot. Tuck connects a spy camera to Jack’s optic nerve to find where he is and then uses a broadcast mike attached to Jack’s eardrum to communicate with him and get his help. With Jack initially thinking he is possessed, Tuck tries to organize him to find the crooks, get the microchip and return him to full size before his 24-hour air-supply runs out. Joe Dante first emerged to attention as director of Piranha (1978) and The Howling (1980), two cheerfully entertaining B-budget monster movies that come packed to the gills with sly genre asides and cameos. Dante then had a big hit with the Spielberg-produced Gremlins (1984), a maliciously gleeful trashing of the same territory that Spielberg visited in E.T. – The Extra-Terrestrial (1982). However, Gremlins was the one high-point in Joe Dante’s career and, although he has made much better films since – Explorers (1985), Matinee (1993), Looney Tunes: Back in Action (2003) – nothing else he has made has been a hit. With Innerspace, Joe Dante parodies the classic science-fiction film Fantastic Voyage (1966). Everybody was expecting Innerspace to be a big hit, only it wasn’t. Unlike Dante’s Explorers, Innerspace was not a worthwhile film that never found its audience, rather it was a chaotic comedy that never came to life. Fantastic Voyage was a film conducted with a mind-boggling sense of wonder; Innerspace by comparison uses the idea as only the basis of a screwball comedy. The film’s failure revealed the limitations of Joe Dante as a filmmaker – that his perpetual in-joking and genre in-referencing was only speaking to a limited fan audience and without much more than that there was little to his films. Dante maintains an energetic pace, but this only reveals the plot’s implausibilties. The plot stretches credulity at too many points. The worst of these is a convenient piece of sleight of hand about using ‘nerve stimulation’ by the miniature submarine to instantly rearrange Martin Short’s face into Robert Picardo’s. Dennis Quaid’s cocksure playing is likable. (This is the film where he and Meg Ryan met and would later marry). This was also the first major starring role of Martin Short (although Short is playing a part that should have been cast with Woody Allen). 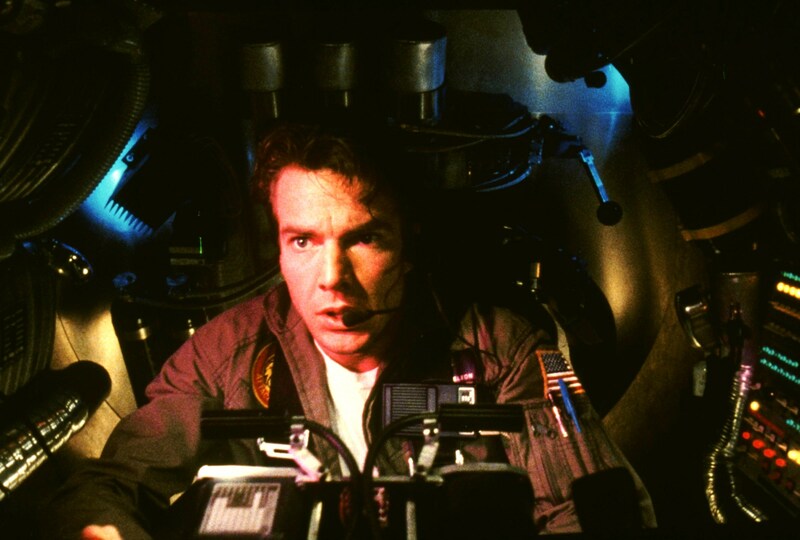 The Industrial Light and Magic special effects are expectedly good, although the only moment the film evokes the same wondrousness that Fantastic Voyage did is the momentarily beautiful image of Dennis Quaid’s sub entering Meg Ryan’s womb and seeing their unborn child’s foetus. Joe Dante’s other films are:– Piranha (1978) and The Howling (1980), the third episode of the anthology Twilight Zone – The Movie (1983), Gremlins (1984), the fine Explorers (1985), segments of the comedy skit anthology Amazon Women on the Moon (1987), the suburban paranoia black comedy The ‘Burbs (1989), Gremlins 2: The New Batch (1990), the excellent Matinee (1993) about a genre fan’s childhood, the toy wars film Small Soldiers (1998), the witty toon adventure Looney Tunes: Back in Action (2003), the Young Adult horror film The Hole (2009), Burying the Ex (2014) about a zombie ex-girlfriend and an episode of the horror anthology Nightmare Cinema (2018). Dante also created the delightful smalltown paranoia tv series Eerie Indiana (1991-2) and produced the short-lived The Osiris Chronicles (1998), as well as the film adaptation of the comic-book legend The Phantom (1996). Screenwriter Jeffrey Boam delivered several other scripts of genre interest including David Cronenberg’s adaptation of Stephen King’s clairvoyance thriller The Dead Zone (1983), The Lost Boys (1987), Indiana Jones and the Last Crusade (1989) and the comic-book superhero adaptation The Phantom (1996), as well as the wrote scripts for the first two Lethal Weapon sequels and created the tv series The Adventures of Brisco County, Jr. (1993-4), a Western with SF elements.